As well as I can tell, this is my father holding his brother's sign. Their younger sister, Pauline, is standing behind him. 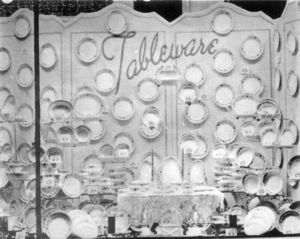 If this is so, the year was around 1932 and Uncle Irving was 21. The sign reads "Photography by I. Skipper" and there is a caricature of a man standing behing a tall tripod on which is what appears to be a movie camera. 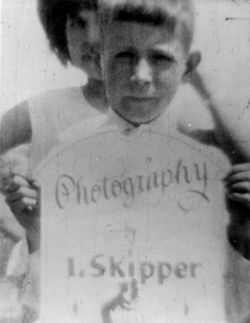 My father’s older brother, David William “Irving” Skipper, was a photographer and sign painter from an early age in the 1920s. 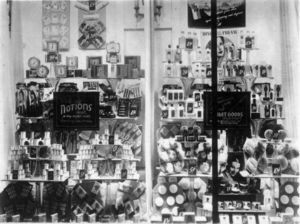 He quit high school in England, Arkansas, and moved to Little Rock to work for the Sterling Variety Store. 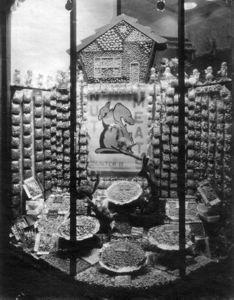 He made display and ad signs and continued his photography. 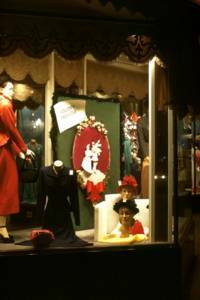 He was using a silk-screen process in the 40s and into the 50s to make display signs and even to print a person’s signature and its mirror image onto ties. He eventual phased out of the job at Sterling and made his living as a professional photographer doing animated ads for TV, movies to promote businesses and civic organization, and custom film processing, printing, and film-strip productions. He was semi-retired by 1980 at the age of 70, but continued to buy and try out new cameras until his death in 2000. He had moved from movies to video, but did not make the change to digital imaging. He moved to a residence on Broadway in the mid-50s and was living there when this business card was made. He and his beloved wife, Nila, had no children and, after her death, their nieces and nephews disposed of their personal possessions. 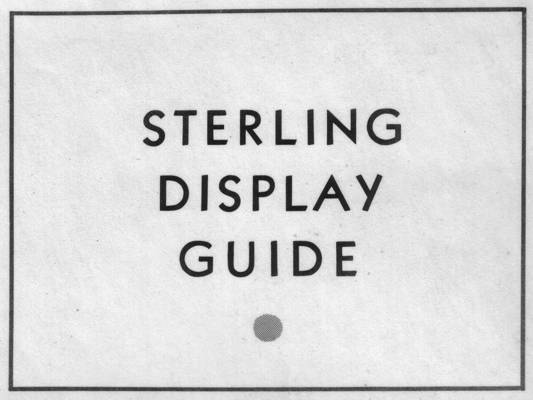 I recently looked through some of the images that I had sorted earlier and found this little hand-made booklet of department store display windows. 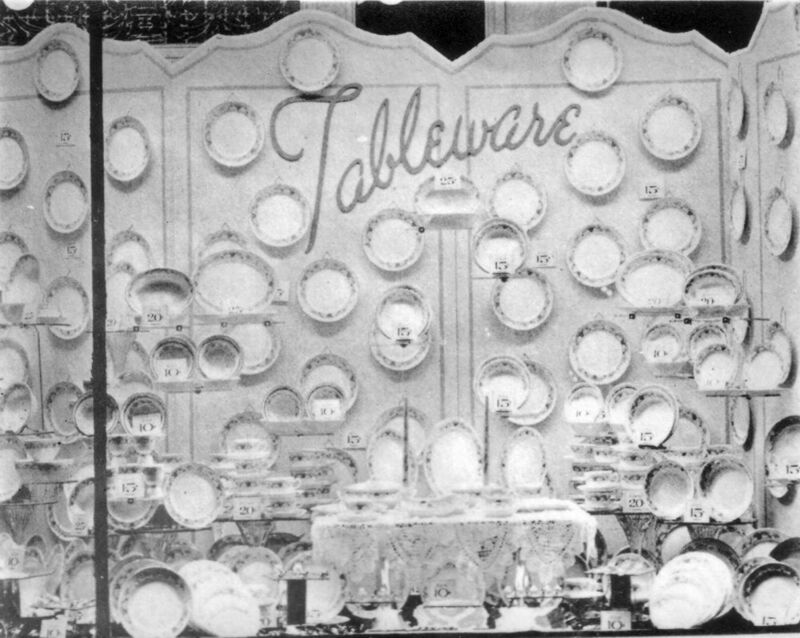 Based on the prices and styles displayed, I guess that the photographs in the booklet were made in the mid-1930s. 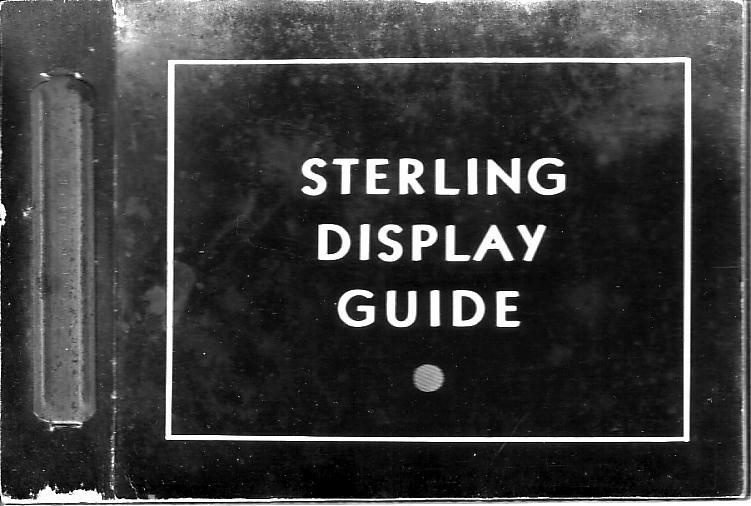 I am not certain that my uncle took the photos, but it seems to be the type of thing he would have done for Sterling Co. He was 25 years old in 1936. The overall dimension of the booklet is 4x6 inches. The cover is a white on black print on glossy photographic paper. The back cover seems to be a piece of cardboard stiffener from a package of photographic paper. The pages are printed on velum photographic paper. The images seem to have been contact printed from 4x5 inch sheet film negatives. The booklet is held together with a metal binder that fits holes two inches apart. It is a common ACCO Fastener from ACCO Products, Inc. of New York, Pat. #1658052. Two of the images seem to have a fine half-tone pattern, so they may be copies made from printed images. There is great detail in the prints that is not visible from these digitally scanned images. I can read many of the display ads with a magnifying glass. (I use an old Takumar 55mm lens as a magnifying glass). The larger images, available at a click, have just about as much detail as I see with the lens. Title Page - The title is repeated in black on white on the first vellum page in the booklet. The line art work looks very much like work I helped him do in 1959. He usually made a pen and ink original and then made a copy negative. In the late 50s, he was using ‘rub-on’ letters for the text. The little circle is formed of small white dots on the cover and, of course, small black dots on this inside title page. Prints on 'velum' photographic paper usually are of low contrast; the blacks are not as black and the whites are not as white as in glossy prints. Click on the following images for 780x1000 images (140 - 175 KB). If you do click and download these large files, be sure to enlarge your window (or resize the image, if your browser automatically resets the size) so that you will be able to see all the detail of what you've taken the time to download. 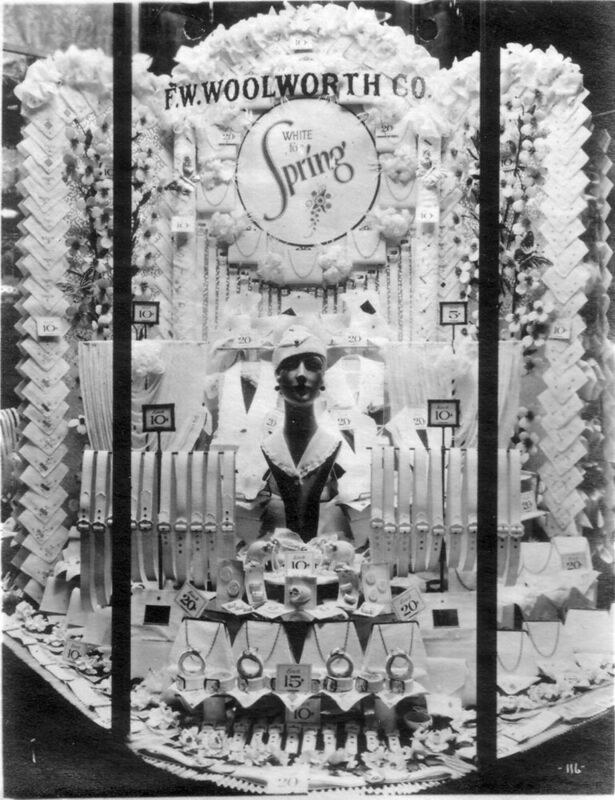 Woolworth Spring Display - All the display windows seem to have been photographed at night and illuminated by lights in the display window. 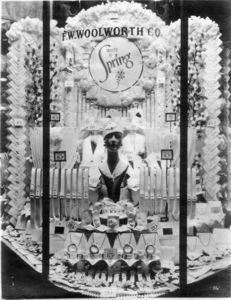 F. W. Woolworth Co. was a competitor of Sterling. 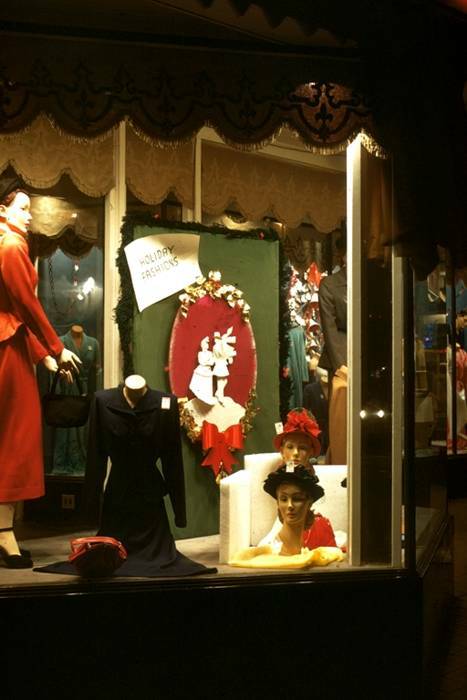 This window displays “White for Spring” women’s accessories. They include belts, buckles, buttons, and bracelets and some fabric things I can’t identify. Prices are 5¢ to 20¢. The manikin head wears a little white cap and has a white collar. The image is numbered 116. Buttons - This is an indoor display with a Dutch windmill theme. It was lighted by a single flood or flash light. The detail is not as good as some of the other prints, but a couple of price cards are legible. The price is 10¢. 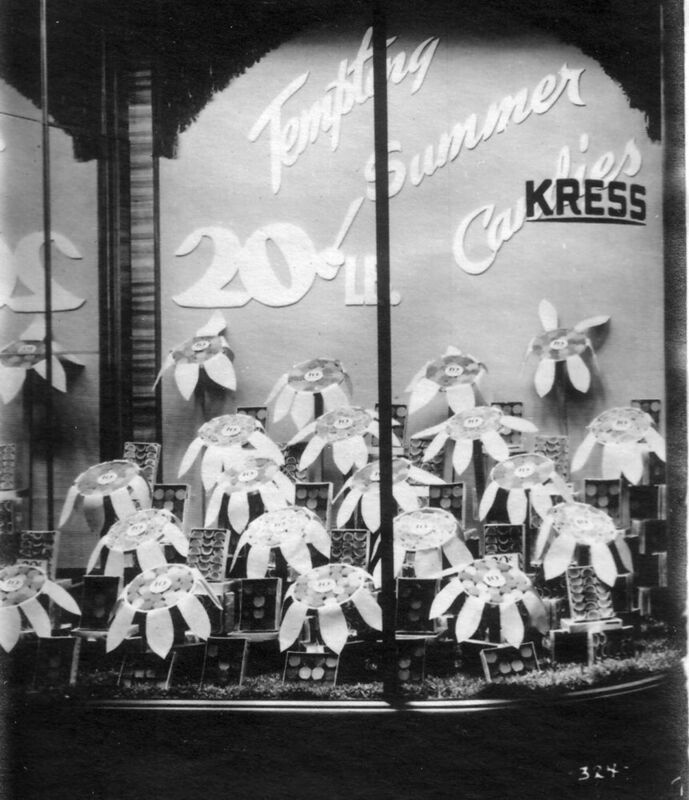 Tempting Summer Candies - This was a Kress window display. 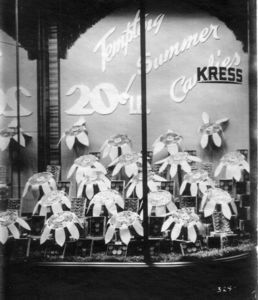 Kress was another competitor. 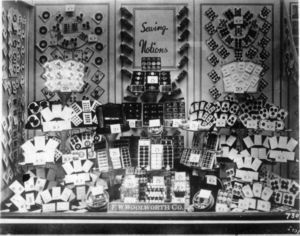 The candy is 20¢ per pound and the boxes are displayed as daisies. Boxes of citrus slice candy and filled chocolates are visible behind the daisies. This image has the number 324 at the bottom. Nuts and Meats - Counter 11. Is that a ‘nut house’ over the squirrels? 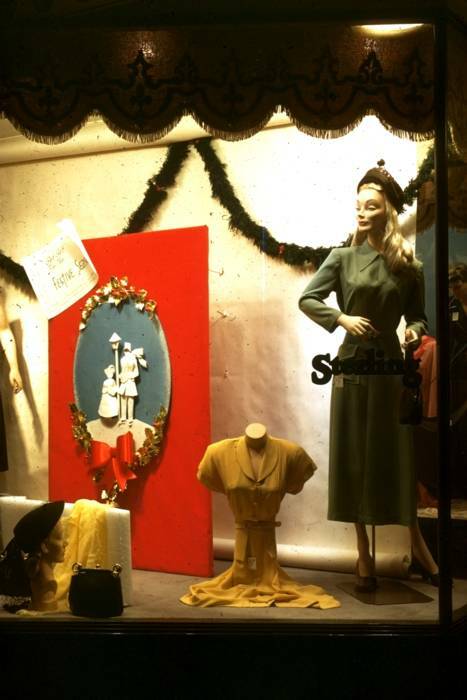 Some of the display seems to be on corrugated paper. I don’t see any meat, but the nuts seem to be priced at 10¢ for 3 ozs. 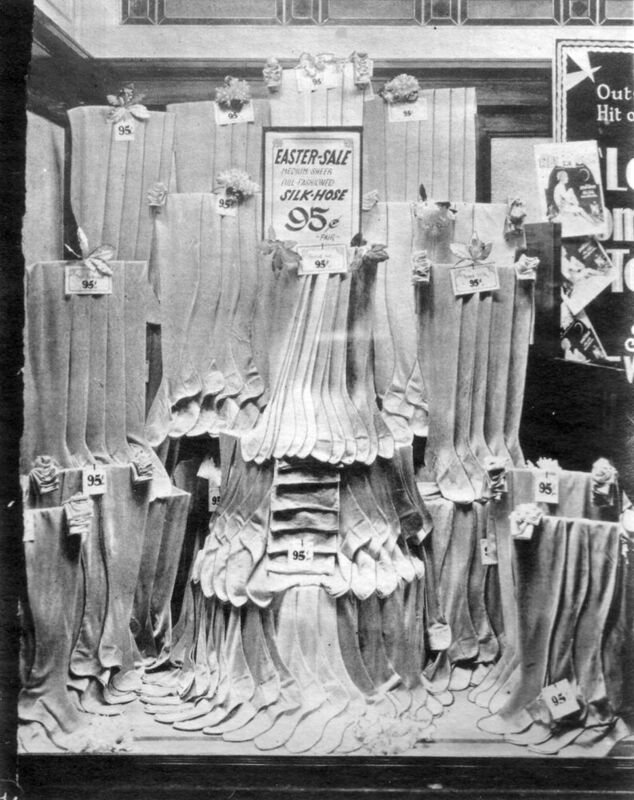 Easter Sale - When did silk hose disappear? 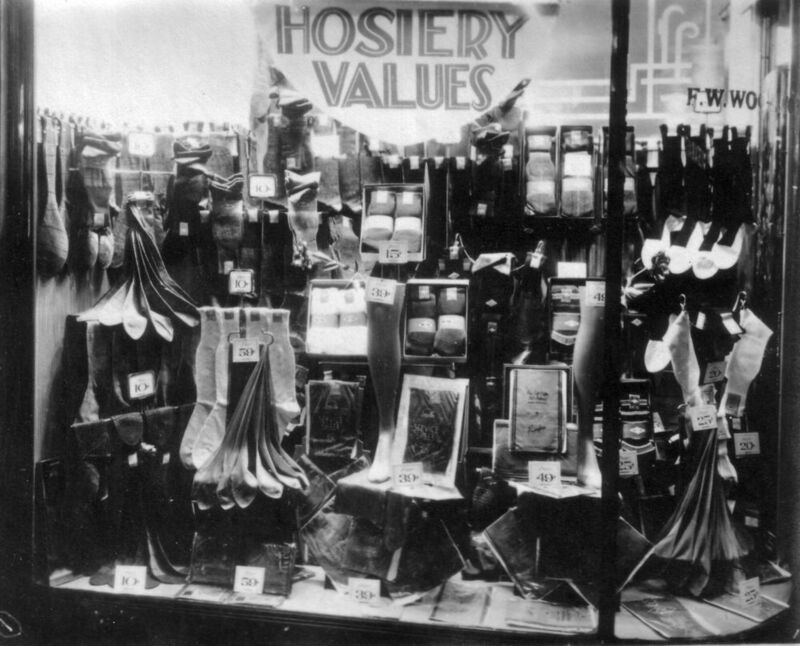 When were stockings 95¢ per pair? I think that this must have been between 1935 and 1940, but perhaps as late as 1945. The silk hose are medium sheer, full fashioned. This print seems to show a fine half-tone pattern and so may be a copy of a printed image. 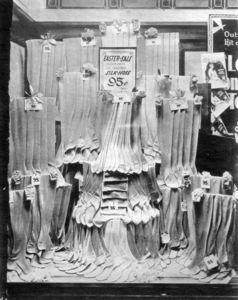 Hosiery Values - This is another Woolworth display. 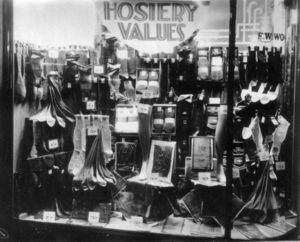 The socks are priced from 10¢ to 59¢ a pair. Sewing Notions - This is another Woolworth display window. The items are mostly buttons and thread, but there seem to be some special clothing fasteners and some sewing kits. The thread and button prices seem to range from 5¢ to 20¢. The image is numbered 730. 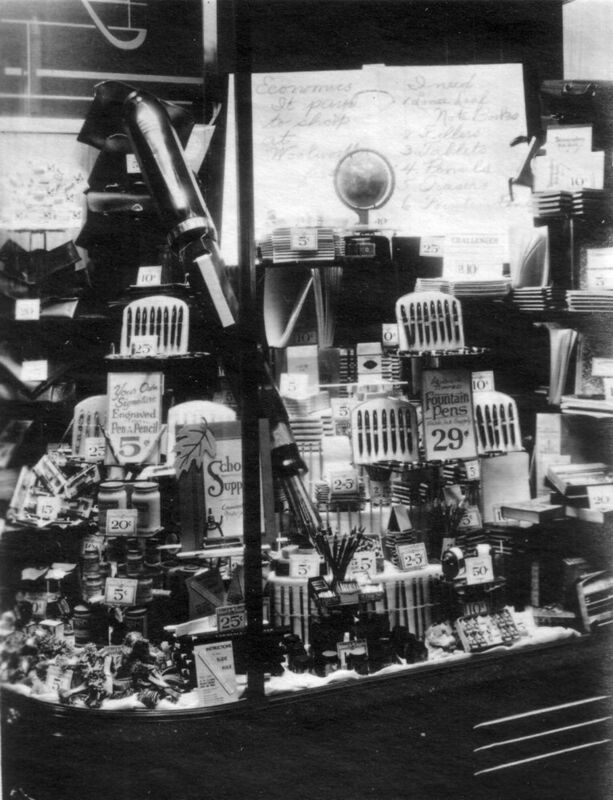 Pens and Pencils - This is a unique display with its giant fountain pen and the big shopping list. 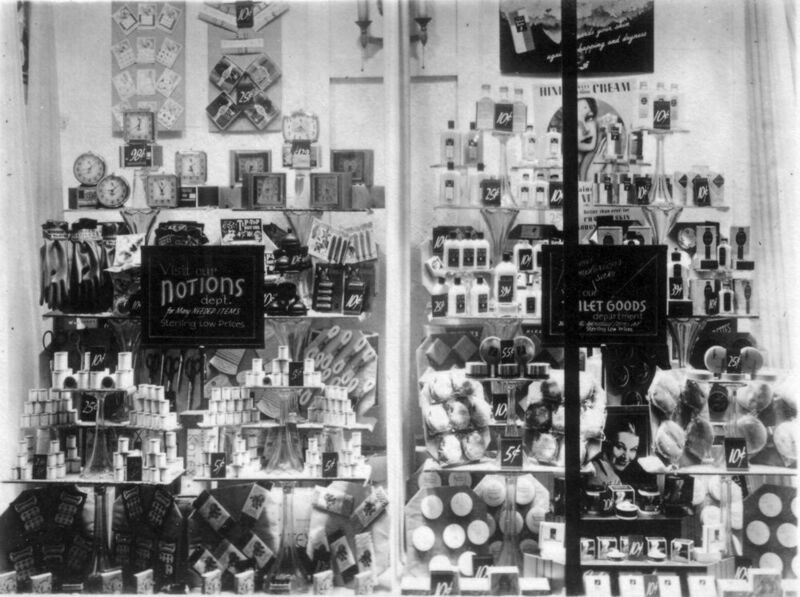 The big note says “Economics - It pays to shop at Woolworth.” and “I need 1. Loose leaf Notebooks, 2. Fillers, 3. Tablets, 4. Pencils, 5. Erasers, 6. Fountain Pen” in fine penmanship. One ad says “Iridium tipped Fountain Pens - Visible Ink Supply 29¢." 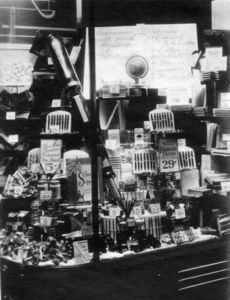 Another - “Your own signature engraved on pen or pencil - 5¢.” There seem to be bottles of ink and there is a booklet titled “Instructions for your Slide Rule.” A pencil sharpener is 50¢. are from another set and probably from another time - perhaps postwar. Hotel Marion Implosion - Uncle Irving had a strip of positive color transparency 35mm film with a sequence of images showing the implosion of the Hotel Marion in Little Rock. The film was uncut. I assume that he did the photography. However, it is possible that he processed and copied the film for someone else and kept a copy for himself. Uncle Irvings's Flower Photos - These are basically generic flower photos. These flower photos were selected from two rolls of 12-exposure 126 Cartridge Kodacolor film that was used in Instamatic cameras back in the '70s. I put them on the web just for general interest. Tornado Damage - A major tornado damaged a large part of Judsonia, Arkansas, in 1952. Uncle Irving rushed up there from Little Rock and took these great photos of the damage to buildings and automobiles and some of the rescue workers.